Banners are mobile RTB blocks that can display Yandex.Direct context ads or media ads. Blocks are inserted in the app content and are placed above such content. Partners can specify the acceptable sizes for the ad space and the maximum number of Yandex.Direct ad blocks themselves. Real-Time Bidding (RTB) technology is used to display full screen advertising in the Yandex Advertising Network. Real-Time Bidding is a technology used to sell and buy ad impressions based on real-time auctions. RTB lets you maximize revenue from ad impressions, as the most profitable ad is automatically chosen out of all advertisers' ads. 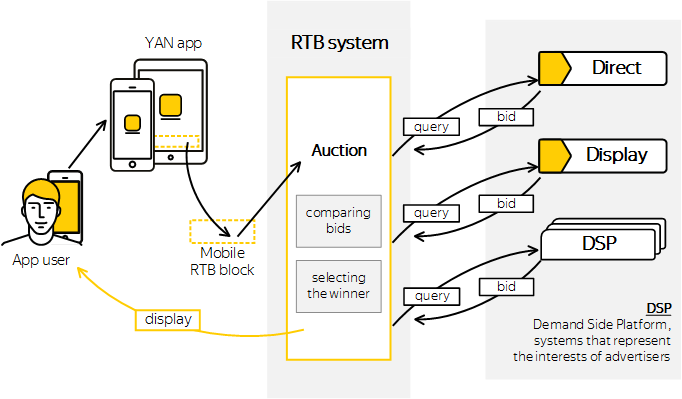 In this type of auction, the sellers are the YAN ad platforms where RTB impressions are enabled The buyers are the DSPs (Demand Side Platforms), which are ad systems that represent the interests of advertisers. The RTB system accepts bids from the DSP and then announces a winner. Auctions are held in real time. As the user loads a web page, the RTB system simultaneously conducts an auction for ad impressions. A request for ads is sent to all participants of the auction. DSP systems have only a fraction of a second to determine how valuable the ad impression is and make a bid. The winner of the auction obtains the right to display its ad. Maximum profit from ad: the ad with the highest auction price is selected for each ad impression. The ability to set a price cap: you can set a minimum CPM threshold for each ad block to receive advertising at the most profitable rates. Control over the list of advertisers: you can block ads from specific advertisers and ads on specific themes, or assign individual cost per impression thresholds for them. Ads that interest site users. Our RTB uses various types of targeting, including contextual and media ads. Complete traffic monetization: if an auction had no bids that exceeded your set cost per impression threshold, your site can be configured to display ads from other systems, including your own ads. Therefore, the resource's potential can be fully realized at an optimal price. How cost per impression is determined for RTB banners. How to create RTB banners using our visual ad code designer. Available settings for RTB banners.